The relationship between a parent and child is quite particular. As a general rule your parents are the first people with whom you build a relationship and during childhood, they care for your welfare. At that time, authority in the relationship is heavily balanced towards the parent. Growing into adulthood, the bond gradually evolves into a more equal relationship but your parent’s experience and support continues to be valued. When you leave your parents’ home to live independently and raise a family of your own, they continue to be cherished as babysitters or an extra pair of hands with the garden or DIY. 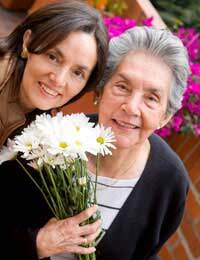 Your parents’ self-esteem remains undiminished; they continue to be needed and useful. However, as time goes by and perhaps your own children become more independent, you may become aware that your parents are not as fit and agile as they once were. Instead of you relying on their help, the time approaches when they need your support. It can be alarming to everyone when the parent/child relationship goes slowly into reverse. Perhaps your previously strong and healthy father can no longer tackle simple jobs in the home. Or your mother is becoming very forgetful. Your parents will almost certainly be upset about their diminishing abilities and may be unwilling to accept what is patently obvious to others. The most important thing to remember is that your parents are still your parents. Under no circumstances should you treat them as children. If you have children yourself, you know that they will always remain your children, no matter how old, independent or successful they become. It is the same for your parents and it can be extremely difficult for them to come to terms with their increasing fragility and possible ill-health. For you too, it will be painful to witness any deterioration in your parent’s independence and health. Even if you don’t remember a loving and supporting childhood, you may still feel apprehensive about a future where your parents have to be cared for. However, it is quite possible that your parents have recognised that their reflexes are slower than before and that it’s becoming difficult to get in and out of the bath. They may want to talk about their care needs with regard to suitable accommodation, and transport requirements if they no longer drive. What they won’t want is to feel a burden or useless. This may be the time to talk at length to your parents about the future. Discuss drawing up an Enduring Power of Attorney that will give you or another person your parents trust, the authority to take decisions on their behalf should they become incapable of doing so. Check on the local hospital facilities, public transport systems and proximity of shops. It is now, while your parents are still relatively fit that you should discuss what they want from the rest of their lives and where they want to live. A list of warning signs below are merely a suggestion of situations that may present themselves and make you think that times are changing. Even if your mother is no longer able to cook as she once did, she will still be able to let you know her secret to a perfect Yorkshire pudding, or the best way to get stains out of a carpet. Even if you know her tips, ask for them again. Make her feel valued. And of course, your father’s method of keeping slugs off the runner beans will be as efficient as it ever was. If your parents need to move into residential care or sheltered accommodation, still involve them in family affairs. Let them know that you value their advice and expertise, that they still have an important role in your life. They may be more forgetful or less able physically; it doesn’t mean that their experiences of life won’t be as valid as they always were. Questionnaire: Are You Suited to Being a Carer?